No, these are not mine. Pretty though. I love garden tools. I really do and I have many. Trowels, rakes, hoes, lawn edgers, shovels, spades and the list goes on. 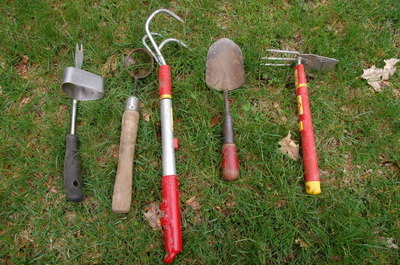 Every gardener needs a good cache of tools. Some of the better made tools are really works of art. I don't have many of those, just basic tools. 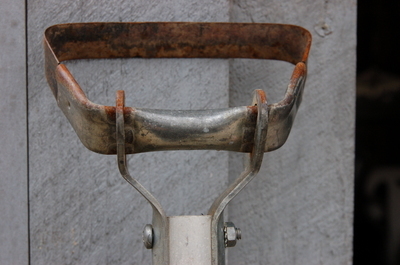 The prettiest tools, in my mind, are those that are weathered and worn with a patina from use. Therein lies a big problem. They get lost in the garden. Oh, yes, these are mine. From the compost heap to one garden then another and another and finally back to the shed where they sit in the wheelbarrow unless I actually hang them. 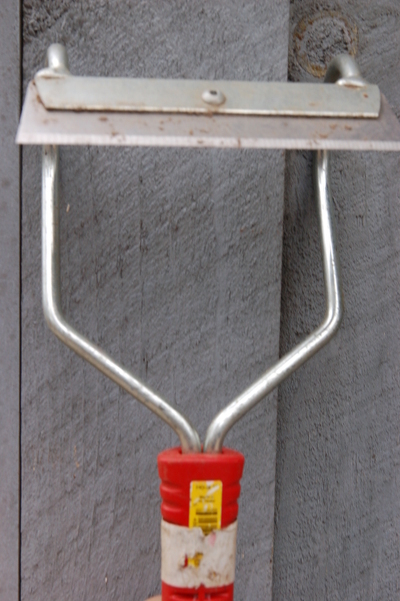 The large tools do hang but the hand tools are in a bucket and it was only upon returning to the bucket to plant the rest of the little bulbs that I noticed my dibble was missing. A dibble does make short work of planting the little bulbs. 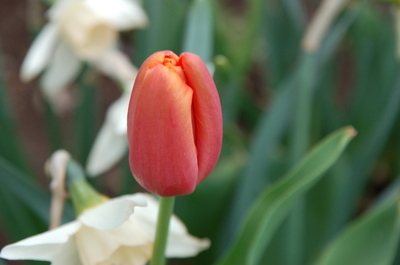 It plunges somewhat easily into the soil and the bulb gets popped in. I then top it off with compost. The big bulbs are different. 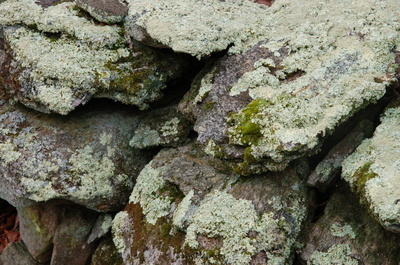 They often require a pickax given the amount of rocks here in this garden. Pickaxes are much harder to lose since they have heft and size. It was about two weeks ago that I noticed the dibble was missing. There are many more small bulbs to plant. Small bulbs are very gratifying but there needs to be an abundance of them to make an impact. One hundred don't go very far. I did plant some with the red handled trowel but it took more time and energy than that required by the dibble. I had to find that dibble or buy a new one. I retraced steps several times and after many days it came to me...look in the garden by the fish pond where you planted the muscari. It was a bit covered with leaves when I finally found it. I brushed them off for the picture. It is still a bit hard to see. The dibble weathered a week or so outside plus the rain of the recent hurricane. I am a pragmatic person. The organic look of this tool almost led to its demise. It certainly slowed down the bulb planting here. A bit of neon solves the problem. I have solved that problem with a can of neon spray paint. The artistic wall of garden tools will have to wait. There is life left in this tool and there are bulbs to be planted. Sacrifices must be made. I need sunglasses to use my tools now. 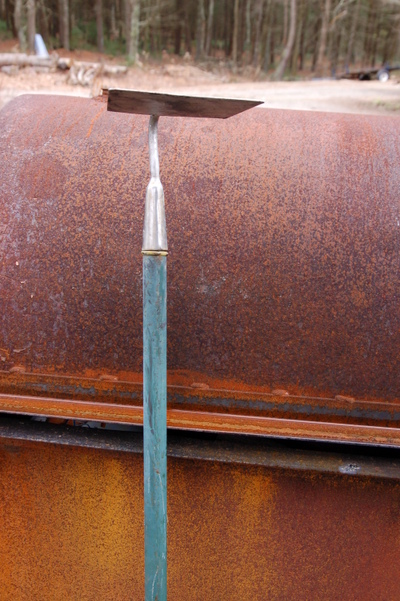 Have you ever lost one of your favorite garden tools? It is not a very pretty day here for 'Hoe Down' with Carol at May Dreams. Sounds like we need a checkered tablecloth, some barbecued chicken and a bit of watermelon. It is a bit too cold here for that but the hoes did come out to play at least for a little bit. The big hoes posed earlier in April and of these hoes there is the traditional hoe, the stirrup/scuffle hoe which is my favorite and then this other no-name hoe which is on an interchangeable handle. I guess it is a 'hoe with no name'. Sad! I do have a collection of hand hoes and they wanted the company of my favorite trowel which I have had for years and which seems to have a loose handle this year! I included the weeder on the left because that band acts as a hoe and a pivot point to remove weeds. The second from the left is a handy little tool although I would prefer a square head to the round one. Still, it works pretty well. The next one is really a fork...artistic license. The favorite trowel and then the grub hoe. One escaped and had to be captured and held down for this picture. It is a triangular headed hoe. This one has a sharp tongue. I generally prefer red handled instruments and you can see that I have painted the trowel handle and the sharp tongued triangle so they are more visible while lying in the dirt. Sometimes they are quite lazy and try to get out of work by hiding. We cannot have that now can we? I seem to like to match my tulips to my hoe handles as this is the first color showing on the spinel red tulips in the river of bulbs. Now that I know what spinel red looks like, I can call some of my hoe handles spinel red. Thanks to Carol for her hoely unique inspiration for the Hoe Down!